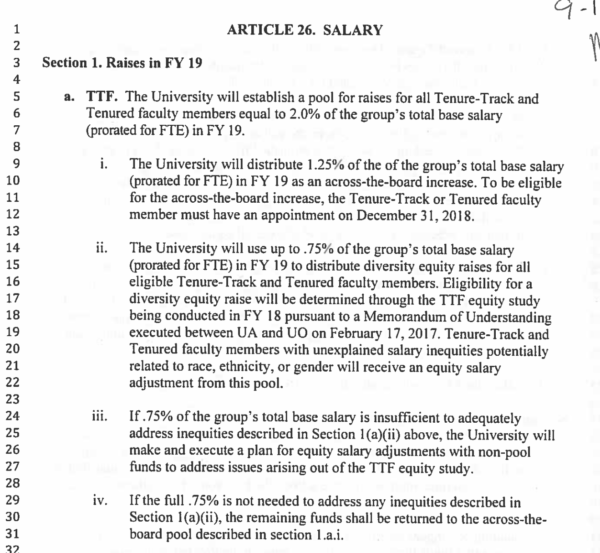 Back in Sept 2017 the faculty union and the administration signed this MOU here, by which the administration would hold back 0.75% of a 2.0% across-the-board raise for TTF to address “unexplained equity differences potentially related to race, gender, or ethnicity” to be paid starting in Jan 2019. The consultant ran the usual regressions, replicating work I and others had already done, which showed no evidence of a gender gap in pay once the standard controls for rank and department were included. (Except, apparently, for Asian assistant professors.) The committee was skeptical of the results, so they had JP Monroe in IR rerun them. Came out the same, again. 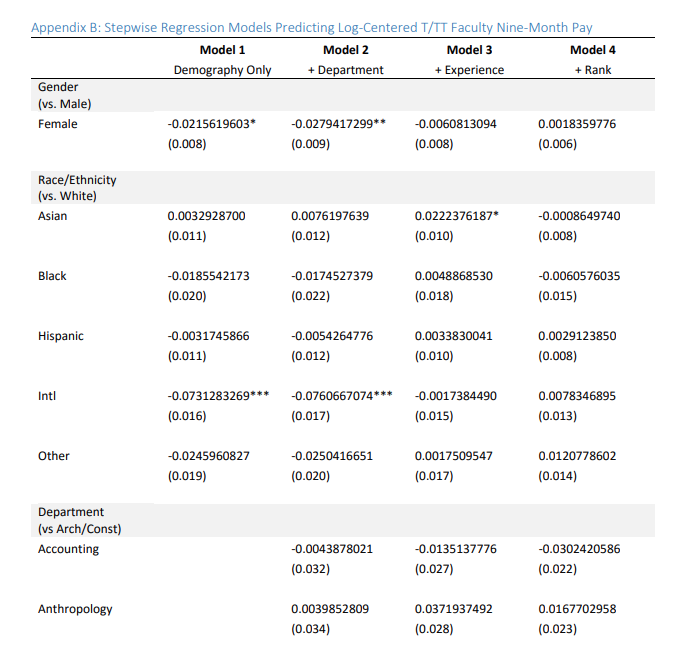 From what I’ve been able to figure out from some leaks and the consulting contract, the administration then decided to proceed anyway, and made a dataset of all the TTF faculty whose salaries were more than ~1.5 standard deviations below and/or 80% or less than their predicted salaries based on rank, time in rank, and department. They then dropped all men who were not racial or ethnic minorities. I think this leaves about 80 people. They then sent departments a request for specific information on the hiring and outside offers of the remaining faculty that might justify their low salaries, or not. The rumor is that productivity was not considered. This Friday the committee met and went through those faculty, one by one, using this information to decide whether or not they should get a permanent raise, and if so how much. I’ll guess 30 faculty survived this process, with an average raise of about $10K, leaving about $150K or $200 for the remaining faculty. Just a guess, this is all secret stuff. 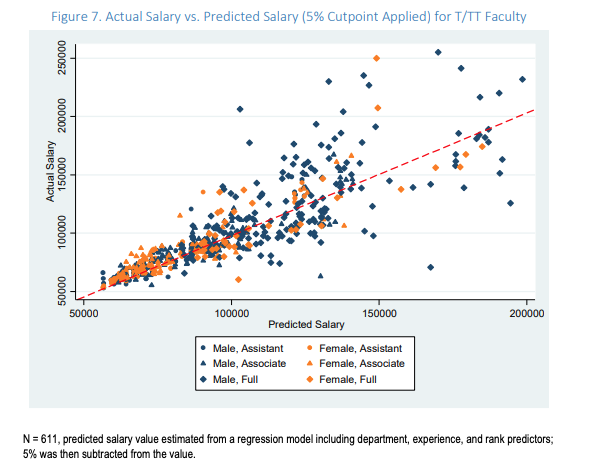 The Faculty Salary Equity Study work group is in the process of reviewing the regression analysis results and setting the threshold that identifies “negative outliers,” namely those faculty members earning lower-than-expected salaries for the purpose of this study. Identifying “negative outliers” is critically important to fulfilling the requirements of this study. Therefore, the threshold the work group establishes will be more inclusive than the common convention of 1.96 standard deviations below expected salary and 80% of expected salary. I am not asking for any individual level data. I’m just asking for the regression results as commonly presented by consultants and researchers in this field, e.g. : http://www.utsa.edu/today/2018/images/GenderEquity-2018-08-29.pdf. Hi Bill – In follow up to our conversation on Friday, I would like to sit down with you, Chris and Melanie to talk about this request and the different interests involved. I talked to Chris and he thinks this makes sense as well. In particular, I think it makes sense to talk about the work of the TTF equity committee and its discussions about how and when to release a report explaining the results and the committee’s work. Chris and I can also discuss the conversations we’ve had about how and when information will be released to UA. Thanks and please let me know some times this week when you’re available. This is a public records request for the public records described in the email below. Please note that the email below to HR Director Missy Matella comes from me as Senate President. She has declined to provide these to me as Senate President. Therefore I’m making this public records request as the editor of the uomatters.com blog. Ms. Matella has these public records and can easily provide them without fees or delays, however if she proposes to charge a fee, I ask for a fee waiver on the basis of public interest and my ability to widely distribute these public records to the public and reporters through UO Matters. Thanks Bill. I’m looking forward to talking about the TTF equity committee’s work, the underlying interests and next steps. I’m also interested in discussing the various roles of campus stakeholders relating to this project, which is being implemented under an MOU between United Academics and UO administration. Bill, with respect to your individual public records request, I’m happy to pass along your thoughts regarding timing to that office again. I previously sent the office your thoughts regarding when the documents should be produced. 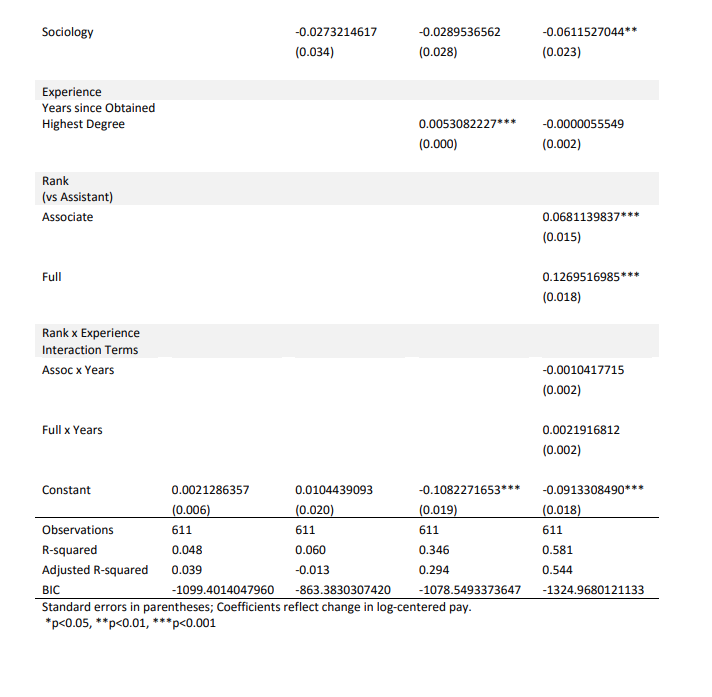 The University of Oregon has received your public records request for “…regression results provided to UO by Berkeley Consulting Group, and currently being used by the Faculty Salary Equity Study group…” on 03/11/2019, attached. With this email, the office is providing you with an estimate to respond to your requests. The office estimates the actual cost of responding to your request to be $435.69. Upon receipt of a check made payable to the University of Oregon for that amount, the office will proceed to locate, copy, and provide the records you have requested that are not exempt from disclosure. Your check may be sent to the attention of Office of Public Records, 6207 University of Oregon, Eugene, OR 97403-6207. When I talked to Ms Matella at the meeting about charging me $435 for a document she had on hand, her response was to deny that she had the consultant’s report, then say she had to follow Kevin Reed’s (purposively dilatory) procedures, and then to say that she did not want to release anything until the process was over, the equity raises had been determined along with the remaining amount to be paid out ATB if any, and (to paraphrase) the administration and its PR flacks had decided how to spin the results. Needless to say these are not justifiable reasons for delaying release of a public record under Oregon’s public records law. My guess is that faculty – female, minority, or generic – will be lucky to see any money by the end of spring, at which point the complaints and lawsuits from those who feel that this secretive process has harmed them, or not benefitted them enough, or that it has violated Oregon’s new Equal Pay Act will begin. Too bad. The simple takeaway from this should have been the very good news that, unlike most universities, UO has very little detectable pay discrimination. Instead it’s the same old news – our administration can’t handle transparency. Tagged Kevin Reed, pay equity. Bookmark the permalink. Stupid question time: why not file this request under the rationale of making sure the CBA is being implemented? That should be free. Yeah, that’s what I thought too. But Reed’s office charges the union too. Kevin made HR get rid of all their hourly classified staff, now they have no reason to charge you any fee. Kevin and Missy, and all their staff are salaried, they get paid the same whether they fulfill your request or not. Fees can only be charged for actual, not punitive costs to produce the records. on meeting an obligation that is relatively minimal. Something is way wrong here. I’v been waiting for this report because I believe I am one of the very very few women who indeed has a low salary that cannot be explained through any other means.